Canadian Eventing athletes closed out the international competition season in North America over the weekend competing on two coasts at the CCI Galway Downs International Three Day Event in Temecula, CA, USA and the CCI 1* Virginia Three Day Event held in Lexington ,VA, USA. 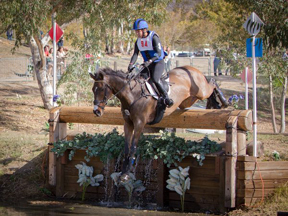 In California, Kiyomi Foster of Surrey, BC; Canada’s only CCI3* entry in the division at Galway Downs, placed in the top ten riding Tasman Sea, her own 16-year-old New Zealand Thoroughbred gelding. The pair led off their first CCI 3* competition in 14th place on a dressage score of 63.7 penalties before tackling Ian Stark`s (GBR) cross country course. Foster and Tasman Sea faced tough questions on course earning 20 jump and 7.2 time penalties ending day two on 90.9 penalties. Sunday’s show jumping round proved to be difficult with the pair taking down four rails for 16 faults and 3 time penalties, finishing on a final score of 109.9 which was good for ninth place. “Galway was great! It was such an incredible experience for me; it was definitely the biggest and hardest course I have ever done! Tasman Sea was pretty excited when we got to Galway, he has competed there many times before and knew that there was big exciting stuff happening, commented Foster. In the CCI 2* division, Leah Breakey of Carstairs, AB and Master Plan, Breakey’s 16-year-old Canadian bred Oldenburg gelding by Duetsmister, placed 20th on a score of 95.3 penalties. The CCI 1* division, James Atkinson based in Ramona, CA aboard Maddy Mazola`s 11-year-old Man on a Mission III, an 11-year-old Oldenburg gelding by Come On, placed seventh by completing the competition on their dressage score of 48.3 penalties. Finishing in 27th place with a total of 67.6 penalties was Olympian Hawley Bennet-Awad, of Langley, BC currently residing in Temecula, CA and Bodark, the six-year-old Thoroughbred gelding co- owned by Bennett-Awad and Jan Hawthorne. Rebecca David McIsaac of Canmore, AB and Irish, Cathy Anne David`s 15-year-old Canadian bred Thoroughbred by Elphin Cronan, finished in 33rd spot with 78.8 penalties. Hunter Trombley of Airdrie, AB and Zanetti, her 17-year-old Thoroughbred gelding by With Approval, rounded out the Canadian contingent finishing in 35th place on a score of 86.5 penalties. On the eastern shore of North America eventers took to the field at the CCI 1* Virginia Three Day Event. Siobhain O’Connor of Guelph, ON and Faux Indigo, Margot Acton’s eight-year-old Holstein by Fabuleux, completed the CCI 1* division in 20th place with 106.5 penalties while Sawyer Gilker of Montreal, QC and Fine Art, Sawyer and Lynden Gilker`s six- year-old Thoroughbred by Diligence, finished 17th in the CCI1*JY division having earned 91.6 penalties. For complete Galway Downs results click here. For complete Virginia Three Day Event results here.